There are honestly only two things I can imagine having tattooed on my body because I know I’ll love them forever. It seems a bit … much. 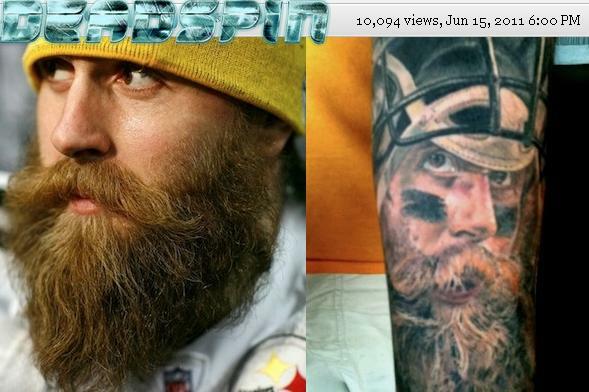 But it’s certainly not the most ridiculous Steelers tattoo we’ve ever seen. Remember this one? What the hell, why not go the distance and put Aaron Smith on the other arm and Casey Hampton – appropriately – all around the naval? Then maybe he could become a badass rapper called D-line Black N. Gold. I walked into a poker room in Seattle once wearing a Steelers shirt and was promptly accosted by a guy who insisted on showing me every single one of his five Steelers tattoos, including the logo inside his lower lip. I’m just glad none of them involved him dropping his pants, because I’m pretty sure he would have done so. I smiled politely and backed away slowly. I love my team, and I love tattoos, but there is such a thing as taste and moderation…. THE CURSE IS BROKEN! You talked about the Pirates and they still won! Yippeee! I have to admit- I just don’t understand tattoos- don’t find them attractive in the least and on older people- eeewwwww. And being a nurse, I have seen alot of them on ALL types of people and believe me, the older you get, the worse they look. Hope you feel better soon, Ginny. All the very best to you while you get to the bottom of your medical problems; you have a widespread legion of very loyal minions sending healing vibes your way! Sweet V….Hope you feel better soon. Sorry to hear that you are down. You have the prayers of thousands for here. Please let us know if you need anything!